Alan Kemister is the pen name of Dr. Phil Yeats, a research scientist who began writing fiction after retirement. He chooses to write under a pen name to keep the fictional science in stories dealing with environmental issues separate from the real science in reports of the results of his oceanographic and environmental studies. Hopefully, the science described in these stories will have a 'ring of truth' to it, but it may, in fact, be entirely fictional. I published the second book in my Barrettsport Mysteries series back in December. Pretty stupid of me but I am only just now getting to trying to publicize it. Here is a picture of the cover. With the fond hope of expanding visibility of my books I joined a reader/writer website called allauthor.com. They have a monthly contest for covers. I entered my cover for Tilting at Windmills in this months contest. If you are interested you could vote for it at my covers voting page. Wow! That happened quickly. My first novel, A Body in the Sacristy, is now available on Amazon. Alternatively, you should be able to find it by typing A Body in the Sacristy in the Amazon search bar. Next step is to get a print version ready for sale. I have established a website - https://www.alankemisterauthor.wordpress.com. It will allow me to post static material about my writing credits as well as the book, A Body in the Sacristy, that I soon hope to have published. It will also allow me to continue blogging about progress with publishing that book and other writing related things. 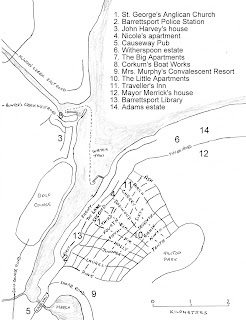 Maps of imaginary town in my novel to be. 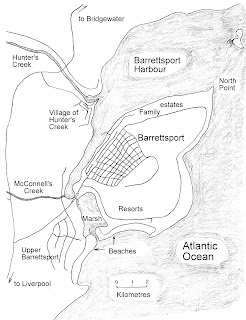 The mystery novel (A Body in the Sacristy) that I am trying to get ready for publication is set in an imaginary town on the South Shore of Nova Scotia. I thought, since it was not a real town, that I should provide maps. 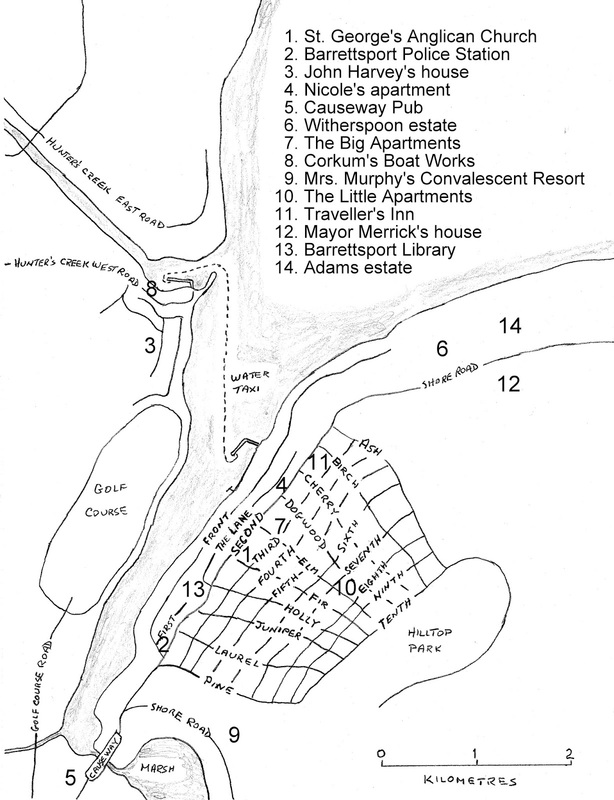 Here are a map of the area and the town. A few weeks back I posted my attempt at a cover for the first book I hope to self-publish. Here is my try at a back cover. It needs to include a blurb about the book and this generates a small problem. The novel is a mystery, in some ways a police procedural, but one with more focus on the community and the principal investigators family and friends that I expect in a standard police procedural. So in some ways more of a cozy mystery, but my central character is a police officer and I have no mystical elements. So I seem to be caught in between two sub-genres of mysteries. Anyway, here is my back cover with an attempt at a blurb. Any thoughts would be appreciated. I've had greater success publishing short stories than novels. The answer is simple - deadlines. There are generally submission windows for submission of short stories to anthologies, and short story contests invariably have a deadline. In 2017, I had good short story publishing success for a complete amateur, with three stories in Off Highway: Journeys of Nova Scotia Writers, an anthology published by the Evergreen Writers Group, and another in The Coldest December, an anthology of stories commemorating the one hundredth anniversary of the 1917 Halifax Explosion published by Quarter Castle Publishing. I had two flash fiction pieces published in On the Premises, a New England based literary ejournal, and one in The Stand. I also had one story that was runner up in a short story contest. Not bad for someone who is just dabbling in this creative writing business. Novels are not as simple. There are seldom deadlines for submission, and endless opportunities and excuses for revising, editing, rewriting. I said in a blog post in October of last year that I needed to bite the bullet and publish my first oft-revised novel. Since then, I've done another rewrite. Once again, I find myself in need of something to push me toward publication. This is step one: a cover for my new novel to be - a mystery set in an imaginary south shore Nova Scotia town. If I follow the front cover with a story synopsis, map of the town, back cover, and I don't know what else, I just might turn the manuscript that has been finished for some time into a book. Or, I could go back and revise it all one more time. Off Highway: Journeys of Nova Scotia Writers is a 200-page trade paperback with 30 short stories and poems written by 13 members of the Evergreen Writers Group. 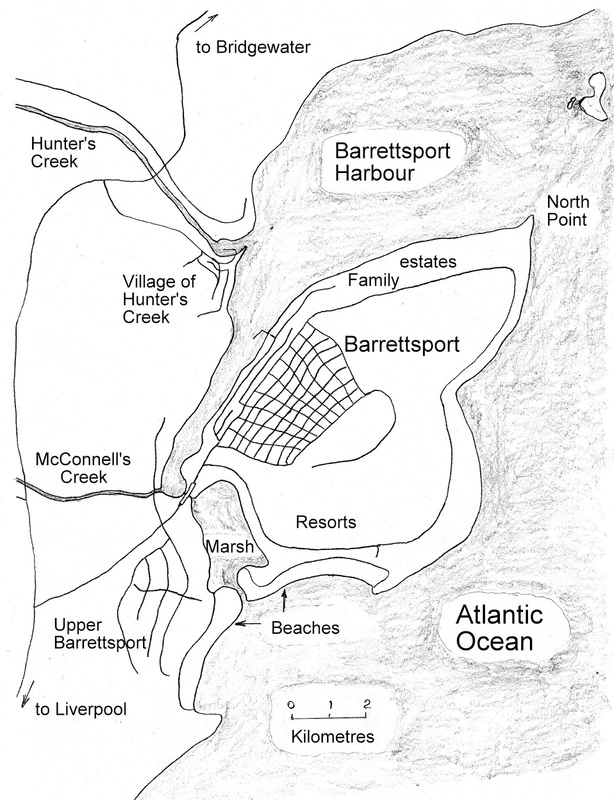 It contains pieces about journeys real and imagined, many based on events in Nova Scotia. There are historical stories, personal memoirs, fictional stories sparked by personal experiences, and purely speculative ones. Here is what Lesley Choyce, a prominent Nova Scotia novelist and poet, said about our book. "This anthology of Nova Scotia authors is a collection of spirited prose and poetry written by a range of writers with diverse and intriguing backgrounds. Here you will find history, poetry, fiction and creative nonfiction by men and women who have been TV writers, animators, genealogists, teachers, playwrights, museum curators, scientists, and more. Many of these writers have travelled far and wide, but they have strong ties and fondness for this province."